As the Miami Dolphins approach the start of their 50th season, it should be noted that the Dolphins were not the first professional football team in Miami. The Dolphins first season began in 1966, but it was 20 years earlier that the Miami Seahawks played their one and only season in Miami as part of the All American Football Conference (AAFC). While the AAFC may not be a familiar league to most football fans today, it was considered a big threat to the NFL during the post-war years of the mid-1940s. Some of the teams that were formed in the AAFC were merged into the NFL in 1950. Teams such as the Cleveland Browns and San Francisco 49ers are very familiar franchises that began in the AAFC. Even the Buffalo Bills had its start in the AAFC, before later being reformed in the American Football League in the 1960s. However, the Miami Seahawks had a far different fate, but a very interesting connection to today’s Indianapolis Colts. As the end of World War II began to look imminent, the wealthy in America began to plan for the future. By 1944, the National Football League had been in existence for 24 years and looked to resume its rather comfortable monopoly following the conclusion of the war. However, there was a strong push for expansion by wealthy investors that were on the outside and wanting a role in professional football. The established NFL owners felt that expansion of their league would dilute the public interest and ultimately dilute their earning power. Therefore, the owners chose not to expand their league. This decision would lead to the formation of rival leagues. One league was in very good positon to disrupt the NFL’s status quo. The All American Football Conference was founded by Chicago Tribune Editor Arch Ward on June 4th, 1944. Ward was the originator of baseball’s All-Star game and football’s College All-Star game. Ward brought together a number of wealthy football enthusiasts to become owners of new franchises. Given inside access to media outlets and strong financial backing, the All American Football League was formed and in good position to challenge the NFL. On November 21st, 1944, Ward hired Jim Crowley as the commissioner of the new league. Crowley was one of the famed “Four Horseman of Notre Dame” coached by Knute Rockne. Ironically, the NFL commissioner at the time was Elmer Layden, another one of Rockne’s four horseman. The new league quickly assembled six franchises including: Buffalo, Chicago, Cleveland, Los Angeles, New York and San Francisco. The Cleveland franchise hired Paul Brown as their coach. Brown had coached Massillon High School to six championships in nine years, and led Ohio State to the 1942 National Championship. Paul Brown’s innovations would not only impact the excitement of the game played in the AAFC, but led to changes in the NFL that helped guide the evolution of the game to what it is today. Brooklyn would later be added as the seventh franchise. The league had hoped to add Baltimore as the eight franchise. The ownership group was headed by retired boxer, Gene Tunney, and the group was considered well-funded. However, Baltimore was unable to get an agreement with Municipal Stadium in time to be awarded a franchise. The AAFC needed to add one more franchise to have a properly balanced league. In addition to Baltimore, there were several other cities that were competing for the last franchise. However, it was an unlikely candidate that ultimately got the eighth and final franchise for the inaugural season. At an ownership meeting on December 8th, 1944, the AAFC awarded their eighth franchise to Miami. The Miami News reported on December 10th that the franchise was acquired by Harvey Hester and his partner Doug Wycoff. Wycoff was a star football player at Georgia Tech. Hester was quoted as saying that “he and Wycoff were the principal men involved right now, but they were hoping to include some of Miami’s business leaders in the venture”. The Miami team was awarded over four other cities vying for a franchise. There was a lot of excitement for the award of this team. The team named itself the Miami Seahawks and had secured an agreement to play in Roddy Burdine Stadium. 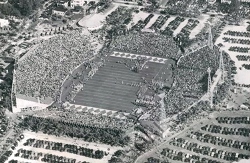 The stadium would later be known as the Orange Bowl. Harvey Hester was a restaurateur in Atlanta, but also had other business interests in both Atlanta and Miami. By comparison to the other franchise owners, Hester was a man of very modest wealth. He was the only AAFC franchise owner that was not a millionaire. Hester immediately went to work to build his team. He hired Jack Meagher as head coach of the Seahawks. Much like the commissioner of the league, Meagher was also a player at Notre Dame. He played under then assistant head coach, Knute Rockne, as a backup tight end in 1916. He served in the US Marines during World War I and played for the Chicago Tigers in the inaugural year of the NFL in 1920. Meagher coached at a variety of places including Rice University and the Iowa Pre-Flight Seahawks prior to joining the Miami Seahawks. The assistant coaches were equally impressive. Hamp Pool was hired to be the backfield coach. Pool was a stand-out player at Stanford and for the Chicago Bears. He became the backfield coach. Hank Crisp coached the great lines at Alabama for 25 years. He became the line coach. By December of 1945, the team roster was coming into focus. An article in the Miami News on December 13th indicated that Harvey Hester believed he had a decent chance to lure Sid Luckman, the great quarterback from the Chicago Bears to come play for him in Miami. Ultimately, Luckman stayed with Chicago and led the Bears to their fifth NFL championship in 1946. The AAFC teams knew the only way to compete with the NFL for the best players were to provide a much higher salary to join the newly formed league. This infuriated owners such as George Halas. Due to negotiations with AAFC teams, the NFL either had to pay their players and draft choices, or lose them to the new league. By the time players reported for their first training camp, Harvey Hester felt very good about his team and coaching staff. The entire community was excited to have a professional sports team playing in Miami. The All American Football Conference organized their inaugural season schedule around expected weather conditions. For example, Buffalo’s home games were front loaded in the season to avoid too many games being played in the snow and cold. On the other hand, the Miami Seahawks played their first three games on the road. The first seven out of eight games were scheduled as road games. 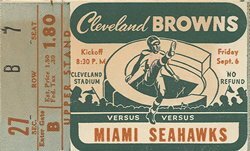 While Miami was excited to see their first professional sports team, they would only see one home game until mid-November of 1946. The first three road games were against the Cleveland Browns, San Francisco 49ers and Los Angeles Dons respectively. The Seahawks lost all three games by a combined score of 95 – 28. Following their third loss, one local paper called the team “woefully inept”. They would arrive for their first home game at Roddy Burdine Stadium with a 0 – 3 record. On Tuesday, October 8th, the Seahawks lost their fourth straight game to the San Francisco 49ers by a score of 34 – 7 in front of a crowd of 7,500 fans. Losing was taking its toll on the initial enthusiasm for the Seahawks. Following their first home loss, the team would go back on the road for three straight Friday night games. The next game was in Buffalo on October 11th, 1946. The Miami Seahawks got their first victory of the franchise by beating the Bisons by a final score of 17 – 14. The joy of getting the first win of the season was quickly diminished when the team traveled to Chicago the next week. The Miami Seahawks lost to the Chicago Rockets by a score of 28 – 7 to earn a 1 – 5 record on the season. The slow start prompted head coach Jack Meagher to abruptly quit on October 22nd. Meagher’s resignation was no surprise and it was quickly accepted by the team Board of Directors. Team President Hester quickly announced that both Hamp Pool and Hank Crisp would work together to run the team for the remainder of the season. At the announcement, Hester would express his faith in the coaching abilities of both men. He further stated: “I was misinformed about players I signed and that there would be changes made”. The two coaches did not have a lot of time to prepare their team for the next game. The Seahawks traveled to Brooklyn to play the Dodgers just three nights later. The coaching change did not reverse the trend of losing games. The Dodgers beat the Seahawks decisively by a final score of 30 – 7. Following the Brooklyn game, the Seahawks finally got to experience their first set of home games. They would play three consecutive Monday night games to start a six game home stand. This schedule represented the first time that a professional football team had played more than one home game on Monday night. This milestone may have provided the inspiration for the tradition of Monday Night Football adopted by the NFL many years later. While the Seahawks would lose two of three consecutive Monday night games, they did beat the Buffalo Bisons once more to complete the season sweep. Miami Dolphin fans would be very happy if today’s professional football team would bring back the tradition of sweeping the team from Buffalo. The Seahawks would lose the next two games at home. However, they did leave home fans with a good feeling by winning the final game of the season against the Los Angeles Dons by a score of 31 – 20. The season was played at Roddy Burdine Stadium. 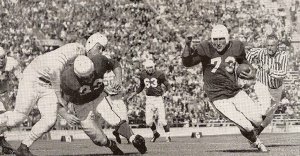 The 1946 season represented a year of frustration for Harvey Hester. To add to his woes, Hester was involved in a car accident while leaving Roddy Burdine Stadium following the last game of the season. In an article dated December 16th, The Miami News reported that Hester was involved in a minor accident and was charged with reckless driving. Although there were no injuries, the accident did result in significant damage to Hester’s car. As the inaugural season came to the end, there was a lot of uncertainty regarding the fate of the team in Miami. It was calculated that the team was $350,000 in debt and owed $80,000 in payroll and travel costs. Team president Harvey Hester was extended well beyond his means. Commissioner Jim Crowley headed to Miami in early December to spend time helping to sort out the financial issues of the Miami Seahawks. While meeting with prospective new ownership groups at the McAllister Hotel on Biscayne Boulevard, Crowley also facilitated loans by the league to help the Seahawks meet their obligations. The most important loan ensured payment to players for the December 16th pay date. The league’s loans also helped the team pay for obligations to United Airlines, rent for Roddy Burdines Stadium and other minor expenses. There were both local and outside groups making a case to take over the Miami Seahawks. One of the local groups was headed by James F.X. O’Brien. O’Brien was the president of the Quarterbacks Club and ran the Tycoon Tackle Company. He headed a group of investors that wanted to keep the Seahawks in Miami. He even approached the Mayor of Miami, Perrine Palmer Jr., to determine the feasibility of playing games on Sunday afternoon, which was discouraged in Miami in 1946. O’Brien even pitched the concept to two city commissioners as well. All parties stated they had “no personal objection” to the idea. The second local group was headed by Frank Harney, sportsman and owner of Manning’s Restaurant at 801 Biscayne Boulevard. Harney assured the commissioner that “his group could put up the money on 24 hours’ notice, provided that they didn’t have to assume the present indebtedness of the Seahawks”. Both local groups considered assuming the debt of the current ownership group a deal breaker to purchase the Seahawks. However, there were plenty of suitors outside of Miami that wanted to take over and relocate the team. One of Crowley’s visitors when he was in Miami was Dr. Mal Stevens. Stevens was the former coach of the Brooklyn Dodgers. He met with the commissioner to discuss options of selling the team to out of town investors. It was believed that he was representing ownership groups from both Philadelphia and Baltimore. However, before any of the local or out of town petitioners could make an acceptable offer, Harvey Hester filed bankruptcy for the Seahawks. Commissioner Crowley immediately moved in and expropriated the team. Jim Crowley and the rest of the league was quietly opposed to the team remaining in Miami. While the City of Miami was growing rapidly following the war, it was still only the 42nd largest city in the United States in 1946. In addition, although the team’s performance and the back loaded schedule were factors, Miami’s attendance dwindled to an unsustainable level as the season progressed. Miami’s average attendance was under ten thousand fans for the final six home games. The commissioner felt there were other markets that made sense to locate the defunct Miami Seahawks. Ultimately, the AAFC awarded Washington DC attorney, Robert D. Rodenburg, and four other businessman the Miami franchise. Having secured a stadium deal, the men moved the team to Baltimore and they reformed the team and named them the Colts. The original Baltimore Colts played in the AAFC beginning in 1947 and were merged into the NFL in 1950. However, they only played one season in the NFL before being folded at the end of the 1950 season due to financial difficulties. In 1953, a new Baltimore Colts franchise was formed in the NFL. The new franchise kept the branding of the original Colts team that folded in 1950. This second incarnation of the team relocated to Indianapolis in 1984 and is now known as the Indianapolis Colts. The Miami to Baltimore story had an interesting twist in 1970. The most significant transaction in Miami Dolphin’s history was the acquisition of Don Shula from the Baltimore Colts. While Miami lost the Seahawks to Baltimore in 1947, the Colts lost what would become the winningest coach in NFL history to Miami in 1970. Twenty years after Miami lost the Seahawks to Baltimore, Joe Robbie, Danny Thomas and the Miami Community was awarded the Miami Dolphins. For those who have been fans since the 1970s, the Miami Dolphins have provided a tremendous amount of civic pride for the South Florida sports fan. While the very early years were difficult for the Dolphin’s ownership team, Dolphin Fans are fortunate that Robbie and Thomas were much better funded than Harvey Hester. The Dolphin’s organization remained steadfast through seasons when they needed to give away tickets at Winn Dixie and had to shift the sparse crowd to one side of the stadium so it looked relatively full for the TV audience. Everything changed when Coach Shula arrived in 1970. As the saying goes, the rest is history. While the Dolphins have not won a Super Bowl since 1975, and they haven’t appeared in a Super Bowl since 1985, there is great optimism that they will compete at a championship level soon. They have the second youngest team in the NFL and will only get better as the young players get experience. 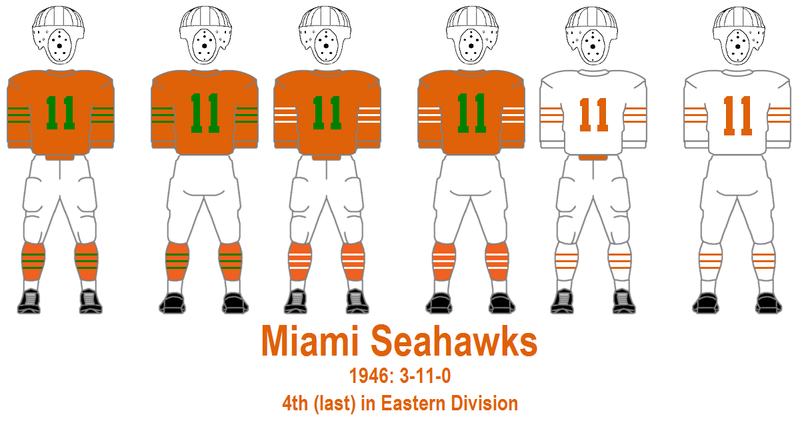 As Miami Dolphin fans sit back and enjoy the team’s 50th season, reflect on the fact that we could be chanting “Let’s Go Hawks” if things had worked out differently in 1946. A season that could have changed the course of football history in Miami. 6 Comments on "Miami’s First Pro Football Team (1946)"
Wonderful article. Thanks for sharing this most interesting part of South Florida’s sports history. In the early 1990’s, I frequented a restaurant in Atlanta, called Aunt Fannies Cabin. It was the “Joe’s Stone Crabs” type of place in Atlanta. I later learned that it was quite controversial for it’s history as the last vestige of former slave run farm in Atlanta, it was surrounded by then burgeoning Buckhead area of Atlanta. One night, I got caught in a rain storm. It took quite a while to get a cab, and as I spoke to owner at the cash register, I noticed the AAFC pictures for the Miami Seahawks. He explained that he and his family formed the team and it eventually folded. I had hoped to get back there to talk a bit more to him about the team, but never did make it back I wonder if that is the same family mentioned in Dr. George’s article. Hello, Saul. This is Casey Piket and I am the author of this article. Yes, it is the same family. Harvey Hester was the founder of Aunt Fannie Cabin, as well as, original owner and president of the Miami Seahawks. Hester also had a bit role in a movie called “I’d Climb The Highest Mountain”, which was produced by Paramount Pictures in 1950. He played the town squire. He also had a role in a movie called “The Great Locomotive Chase”. While the Seahawks initiative was a failure for Hester, he lived a full and interesting life. He died in March of 1967. I was considering putting all of this in the article, but decided against it. I may amend the article to include it. I remember reading about the AAFC in the 1947 Sports Encyclopedia when I was about 8 years old in 1955. The Miami Seahawks seemed to have the “coolest” team name in the Conference. I am a Texan, and supported the University of Texas all my life. Fifty years later, when the AAFC was re-discovered by sports “researchers”, I found out that their “road uniforms” were “orange & white”, similar to the Texas Longhorn road uniforms.